UPDATE: As of September 1, 2017, the latest NHC updates have removed the possibility of the tropical cyclone forming behind Harvey. However, the low could generate increased rainfall across portions of Texas and Louisiana. Interests in Texas and Louisiana should consult their local National Weather Service office for specific impacts. 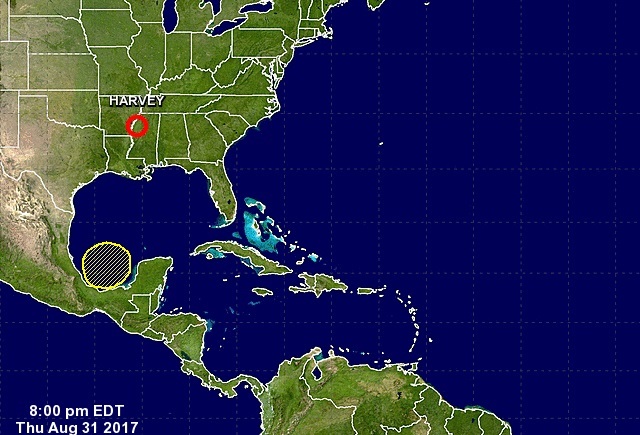 HOUSTON, Texas - The National Hurricane Center issued a Tropical Weather Outlook which predicts a 10% chance of another tropical cyclone forming behind Tropical Depression Harvey and impacting Texas and Louisiana. As of 8 p.m. Eastern Daylight Time on Thursday, August 31, 2017, NHC forecasters say that an area of low pressure (shaded yellow above) has a small chance to form into a tropical cyclone over the southwestern Gulf of Mexico by the weekend. Environmental conditions are expected to become unfavorable for tropical cyclone formation by the weekend. If the system does develop into a tropical cyclone, it could bring additional rainfall to portions of the Texas and Louisiana coasts. This system has a 10% chance of tropical cyclone formation within the next 5 days.